Our Micro Wallet is designed to be the smallest, slimmest and safest wallet available. Our Micro Wallet is a mear 1.3mm thick and is durable, waterproof, eco-friendly, with space for 8 cards and cash, and even integrates RFID protection. This Micro Wallet is as small as a card when closed and is more durable than you can imagine. 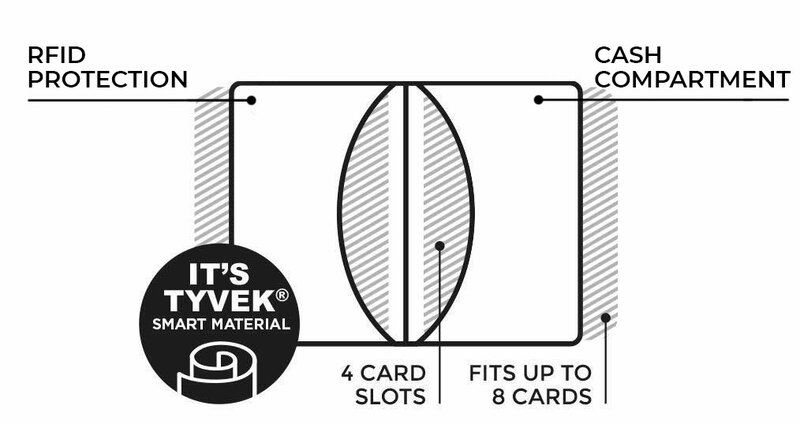 The Micro Wallet is made from one continuous piece of Tyvek® smart material with RFID seamlessly integrated into the fold which makes it a virtually untearable wallet and highly resistant to wear & tear. Apart from being super-durable, the Tyvek® we use for our Micro Wallet is also water resistant, so rain or shine, you know you’re protected with your waterproof Micro Wallet. Even though our Micro Wallet is essentially a paper thin wallet, it still expands over time while remaining beautiful and never compromising it’s durability. Travel anywhere and never mind the elements, Tyvek can handle almost anything that's thrown at it. Keep your pockets slim and light to roam more freely.